a new version of the spreadsheet editor in Google Docs. Today, we’re adding the ability to copy a sheet from one spreadsheet to another in the new version. To start, simply click on the sheet tab at the bottom of the page and select “Copy to...”. Once you’ve selected a spreadsheet, you can open it to find that the sheet has been copied. To give the new spreadsheet editor a try, click the New version link in the top right corner of any spreadsheet. There’s more info about this feature in the help center and let us know what you think in the forums. 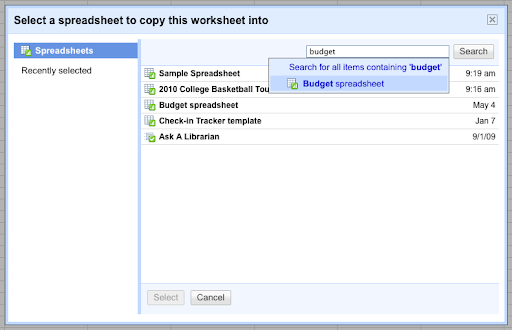 A few weeks ago we introduced a new version of the spreadsheet editor in Google Docs.